While I was visiting some family in Germany our MIB Control, Birger, told me about Ulisses Spiele: a game publisher and distributor that happens to have their office in the same township as my folks. Ulisses is the largest roleplaying game publisher in Germany, led by their hit game Das Schwarze Auge (The Dark Eye); they also publish the German version of Pathfinder, and as a distributor they carry Steve Jackson Games products among many others. I sent an email to their General Manager, Markus Plötz, who invited me in for a visit. Markus was a fantastic host; he gave me a tour of their offices and warehouse, which honestly looked kind of similar to our offices at SJ Games and Warehouse 23. We even managed to talk a little business over a cup of coffee and get a picture together in their online store, F-Shop. 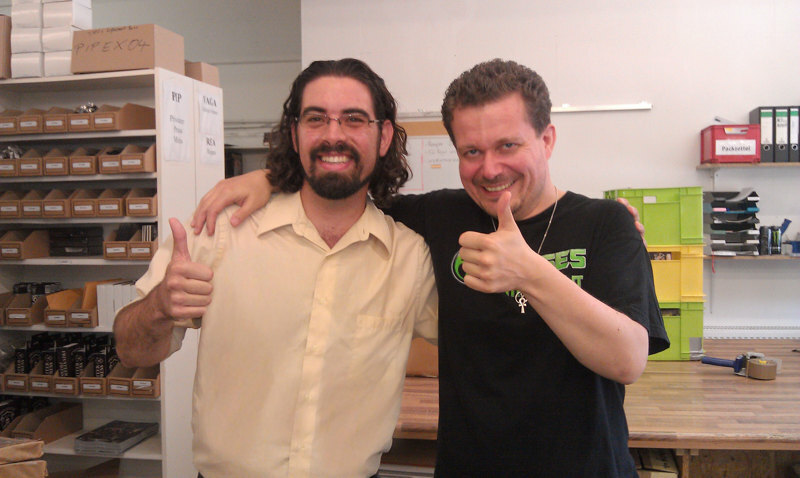 I also found out Markus was coming to Gen Con this year, and we agreed to meet up again there. We ended up having dinner together at the Munchkin Tavern, and in October it will be my turn to visit him at Essen Spiel. I don't usually like to mix vacation time and work, but it's always nice to meet new people in the business. And to think it was right in my backyard all those times I've gone to visit!